Stocking hooks designed to hold Christmas stockings securely along a mantel sold individually. 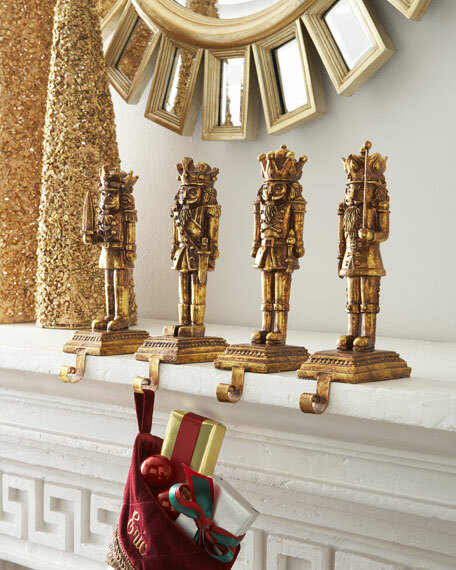 Available styles (listed left to right): nutcracker with dagger up (style 70), nutcracker with dagger down (style 7B), nutcracker with baton down (style 7D), or nutcracker with baton up (style 7E). Each, approximately 2.5"W x 3.5"D x 8.5"T; hook, 1.5"L.
Hook supports up to 1.1 lbs. For in-store inquiries, use sku #2003473.